Long ago in Mexico, Pablo and his sister Maria had nothing to give the Baby Jesus at the church Nativity scene. Suddenly an angel appeared and told them, "Pick some weeds for the Child's bed." They did so, and tucked the weeds beneath the Niño. Amazingly, bright red leaves with small yellow flowers burst forth from the greens. 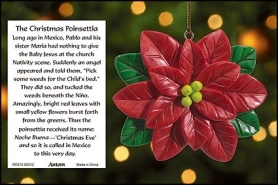 Thus the poinsettia received its name: Noche Buena — 'Christmas Eve' and so it is called in Mexico to this very day.